Striking a fine balance between slapstick physical comedy and pathos—both conveyed in the physical vocabulary of dance and the spoken language of a sports announcer—One Night Only (running as long as we can) pays wry tribute to both the joys and the agonies of a dancer’s (or athlete’s) life. Choreographer/performer Monica Bill Barnes is 44; her co-performer Anna Bass is 39. Barnes founded her eponymous dance company twenty years ago, and Bass has been dancing with her for fifteen of them. Barnes and Bass, especially when dressed identically, resemble each other—but their stage personae and manner of movement are strikingly different. Barnes has gravitas; the humor in her work comes from the contrast between her economy of movement, the stillness of her face, and the oversized situations and emotions she’s portraying. Bass is more of a conventional comedian, a physical clown, with a goofiness that appeals. Both performers are grappling the mortality of their bodies—and their careers (the show’s subtitle, “running as long as we can,” is in that sense quite literal). In one long section, an audience member is selected to read a monologue that runs down the injuries and other physical tribulations that have befallen Barnes and Bass over their dance training and careers—everything from broken bones to performing with kidney stones to a foot injury caused by tripping on a curb to a head injury. As the monologue continues, year after year, an eerie awe sneaks in, as the dates keep creeping closer to the present and the audience grapples with the realization that these women are still dancing in front of us, probably in pain right now. (Full disclosure: I was that audience member at the performance I saw, which may change the nature of the experience, but I found the monologue unexpectedly moving, turning page after page with more of the same litany ahead of me.) Their bodies—their instruments—are beginning to fail them, without them ever getting the outsize respect, admiration, even awe that long-time professional athletes get for their stamina and longevity. The dancing itself is for the most part simple, beginning with a long segment the two perform running on a treadmill—as pared-down as the costumes (black pants with mysteriously capacious pockets and white tank tops), but the intimacy of the McGinn-Cazale Theater and the emotional and physical precision that Barnes and Bass bring to their work make every little detail and movement count. One of the most riveting sections, for example, involves Barnes lip-syncing to a Queen song standing on a small box; Bass dances around her with increasingly larger gestures, but Barnes’s tiny movements are what hold focus. 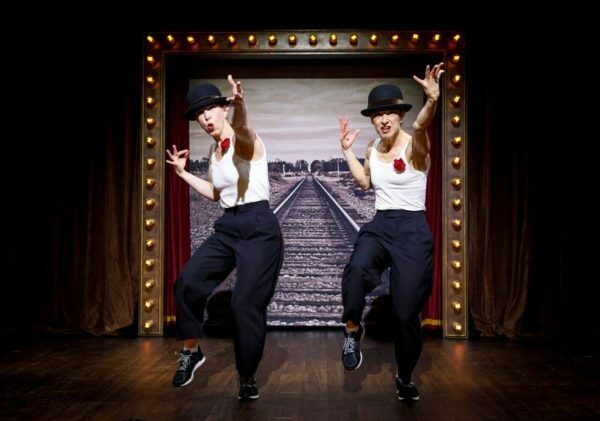 The company’s mission is to “bring dance where it does not belong”—and while this Off-Broadway venue may be a more conventional spot for them than most of their performances (their most recent piece involved leading a choreographed exercise routine while on a tour of the Metropolitan Museum), they’re still twinning dance with something unexpected, in this case sports. Silly sports—competitive snapping, a world spinning record—but treated by announcer Robert Saenz de Viteri with the same breathless moment-by-moment amazement that announcers bring to the NBA finals. It’s a little bit of a one-trick pony; the quotes from the audience (some of which I think are pre-scripted and some actually drawn from interviews conducted by Saenz during the preshow) add an additional layer of humor but don’t really change the focus. Still, while it’s not a show with a lot of breadth, it has a surprising emotional impact; it’s rare to see a piece that conveys so much feeling with so few words—and almost none of them from the main performers.